It's best to make this little beauty the day before you want to serve it. Make cake according to directions on package. Bake in a greased 9 by 13 inch cake pan. Allow to cool....make holes all over the cake. Hint….I use the end of a nut-picker to make the holes. Mix 3/4 can Eagle Brand sweetened condensed milk with 1 can cream of coconut. Mix well. Ever so slowly, pour mixture over top of cake. 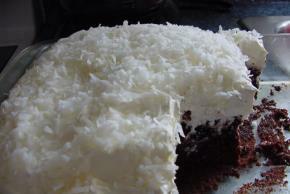 Cover with whipped topping and spread lots of coconut on top. Put in refrigerator and leave overnight. The liquid will make its way inside the cake, and it will stay moist for a week. Believe me....it won't last that long.